The Power Grid: Smart, Secure, Green and Reliable offers a diverse look at the traditional engineering and physics aspects of power systems, also examining the issues affecting clean power generation, power distribution, and the new security issues that could potentially affect the availability and reliability of the grid. The book looks at growth in new loads that are consuming over 1% of all the electrical power produced, and how combining those load issues of getting power to the regions experiencing growth in energy demand can be addressed. In addition, it considers the policy issues surrounding transmission line approval by regulators. 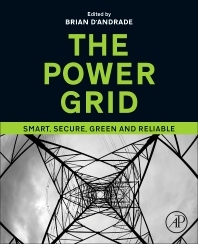 With truly multidisciplinary content, including failure analysis of various systems, photovoltaic, wind power, quality issues with clean power, high-voltage DC transmission, electromagnetic radiation, electromagnetic interference, privacy concerns, and data security, this reference is relevant to anyone interested in the broad area of power grid stability. Dr. D’Andrade is a Senior Managing Engineer in Exponent’s Electrical Engineering and Computer Science practice. Dr. D’Andrade has a diversified set of expertise in electrical, electronic, optical engineering, microelectronic systems, communications, network protocols, software and semiconductors. He has experience in the design, failure analysis and reliability estimation of light emitting devices (LEDs), LCD, plasma, OLED flat panel displays and solidstate lighting.